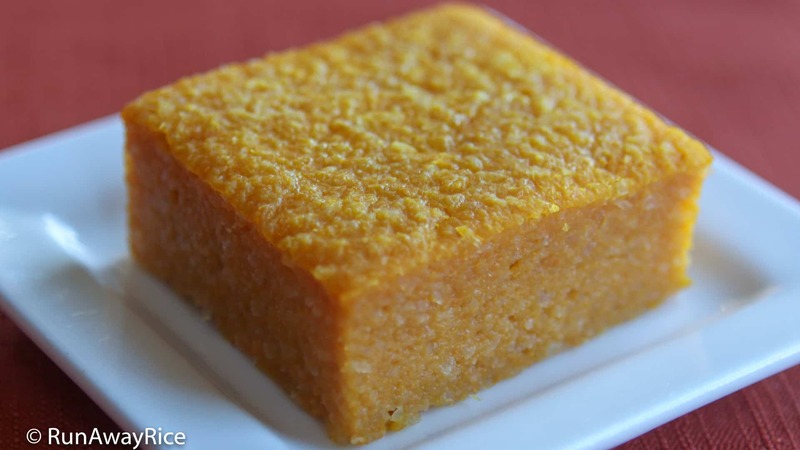 This Pumpkin Cassava Cake (Banh Khoai Mi Bi Do) recipe is a twist on the traditional Vietnamese Cassava Cake (Banh Khoai Mi Nuong). 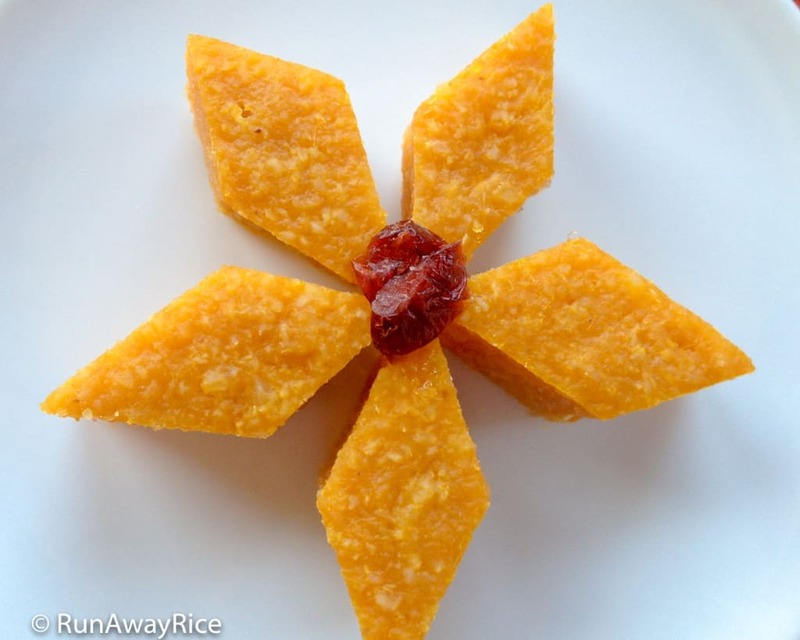 Instead of using coconut and/or mung bean, I use pumpkin puree and the results are heavenly! The pumpkin adds a beautiful rich color and compliments the earthy texture of the cassava perfectly. This delicious Pumpkin Cassava Cake is a tasty baked treat and a wonderful addition to any holiday meal. What I enjoy most about this Pumpkin Cassava Cake is that it’s not super sweet. If you crave a sweeter cake, feel free to add sugar. Give it this Pumpkin Cassava Cake recipe at try and let me know how you like it! Thaw the frozen cassava by immersing bag in a bowl of tap water for 10 minutes. Transfer the cassava into sieve and allow to drain for 15 minutes. Preheat the oven to 375 F (191 C). In a large bowl, add the drained cassava, pumpkin puree, condensed milk, optional sugar, vanilla extract, tapioca starch, and egg. Mix everything together, blending well. Coat an 8 inch by 8 inch baking dish with non-stick cooking spray. Pour the batter into baking dish. Place your hands on either side of the baking dish and shake it back and forth a few times to help the batter settle evenly in the dish. Smooth the top of the cake using a spoon or spatula. Cover the baking dish with foil, sealing it well. Bake for 30 minutes. After 30 minutes, remove foil and bake for another 25 minutes. Insert a toothpick into the center of the cake and it should come out clean indicating it’s done. Glide the butter across the top of the cake coating it evenly. Bake for another 5 minutes or until golden. Remove the Pumpkin Cassava Cake from the oven. Is there something I could substitute for the egg in this recipe? Is it’s function binding or raising? Sincere thanks! Hi Ruth, the egg is a binder. You can use an egg replacement or omit altogether. The cake will be a bit softer but I think it will be okay. Good Luck! I’ve always enjoyed your videos. Thank you for sharing your skills and knowledge. This particular recipe does not contain coconut milk. If I want to have coconut flavor, will it work if I substitute the pumpkin with grated coconut and keep the rest of ingredients? Nevertheless, I will try the pumpkin version when the fall season starts. You can definitely add grated coconut to this recipe and it will be so good! You can also replace the condensed milk with coconut milk if you would like more coconut flavor. If I wanted to make regular cassava cake would I just eliminate the pumpkin puree? Yes, for the traditional cassava cake, you can omit the pumpkin.